Come and enjoy some family fun at the Greek Festival! The Kiddie Village is located next to the Marketplace and directly across from our main stage. See below for details on the fun your children can have at this year's festival. 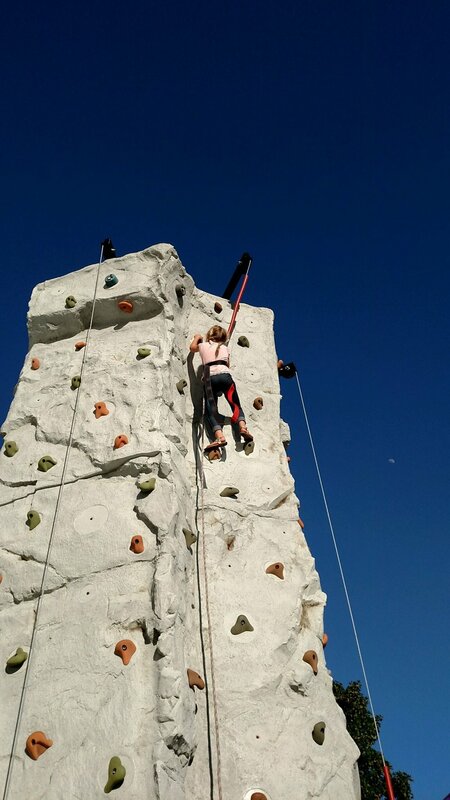 Kids of all ages love to climb this four-station, 24 foot rock wall. Participants are harnessed to an auto belay system and then begin their adventure. Each of the four sides offers a different skill level, from novice to expert, providing a thrilling challenge. This obstacle course offers 40 feet of challenging obstacle entertainment. This inflatable play structure takes participants on a larger journey through tunnels, around horizontal and vertical pop-ups, with plenty of climbing and descending along the way! The attention-getting Dual Lane dry slide is sure to bring everyone running and keep them sliding at your next event! Participants can climb to the top for a sleek and fast drop to the cushioned bottom, guaranteed to satisfy thrill seekers young and old.